Heurystyki to efektywne procesy poznawcze ignorujące część informacji. W klasycznym wyobrażeniu, decyzje bazujące na heurystykach należą do szybkich i oszczędnych decyzji, ale mogą implikować poważne odchylnia od decyzji „racjonalnych” definiowanych przez logikę i model statystyczny. Jest oczywistym, że w realnym świecie ludzie nie zawsze podejmują racjonalne decyzje oparte na ustalonych preferencjach i pełnego Wyraźnie widać, że w prawdziwym życiu ludzie nie zawsze podejmują racjonalne decyzje oparte na ustalonych preferencjach i pełnym dostępie do informacji. Ich zachowanie jest sprzeczne z klasycznym założeniem homo-oeconomicus Wiele ludzkich zachowań podyktowanych jest próbami radzenia sobie ze złożonością świata, ponieważ zestawienie i ocena wszystkich czynników istotnych dla podjęcia decyzji przewyższa zdolności przetwarzania ludzkiego umysłu, szczególnie jeżeli chodzi o decyzje podejmowane na rynku kapitałowym. Heurystyki jest po prostu sposobem oceny wyborów w różnorodnych i zmieniających się otoczeniach decyzyjnych. Celem pracy jest dokonanie przeglądu wpływu heurystyk na decyzje podejmowane na rynku kapitałowym, głównie decyzje zakupu akcji. 1. Andreassen, P.B. (1987). On the social psychology of the stock market: Aggregate attributional effects and the regressiveness of prediction. Journal of Personality and Social Psychology, 53. 2. Baber, B., Odean, T. (2013). The behavior of Individual Investors, vol. 2, part B, Elsevier B.V.
3. Baker, M., Wurgler, J. (2006). Investor sentiment and the cross-section of stock returns. The Journal of Finance, 4 (56). 4. Baker, M., Wurgler, J. (2007). Investor sentiment in the stock market. Journal of Economic Perspectives, 2 (21). 5. Barber, B.M., Lee, Y., Liu, Y., Odean, T. (2007). Is the aggregate investor reluctant to realize losses? Evidence from Taiwan. European Financial Management, 13, 423–447. 6. Barberis, N., Shleifer, A., Vishy, R. (1998). A model of investor sentiment. Journal of Financial Economics, 49. 7. Benos, A.V. (1998). Overconfident speculators in call markets: Trade patterns and survival. Journal of Financial Markets, 1, 353–383. 8. Brown, G.W., Cliff, M.T. (2004). Investor sentiment and the near-term stock market. Journal of Empirical Finance, 11. 9. Brown, G.W., Cliff, M.T. (2005). Investor sentiment and asset valuation. Journal of Business, 2 (78). 10. Brown, P., Chappel, N., da Silva Rosa, R., Walter, T. (2006). The reach of the disposition effect: Large sample evidence across investors classes. International Review of Finance, 6, 42–78. 11. Buczek, S., Pietrzak, M. (2004). Stadne zachowania analityków. Parkiet, 3, 6–8. 12. Caballe, J., Sakovics, J. (2003). Speculating against an overconfident market. Journal of Financial Markets, 6, 199–225. 13. Calvet, L.E., Campbell, J., Sodini, P. (2009). Fight or flight? Portfolio rebalancing by individual investors. Quarterly Journal of Economics, 124, 301–348. 14. Daniel, K.D., Hirshleifer, D., Subrahmanyam, A. (2001). Overconfidence, arbitrage, equilibrium, asset pricing. The Journal of Finance, 3 (56). 15. Daniel, K., Hirshleifer, D., Teoh, S.H. (2002). Investor psychology in capital markets: Evidence and policy implications. Journal of Monetary Economics, 49, 139–209. 16. De Long, J.B., Shleifer, A., Summers, L., Waldmann, R. (1990). Positive feedback investment strategies and destabilizing rational speculation. Journal of Finance, 2 (45). 17. Dhar, R., Zhu, N. (2006). Up close and personal: investor sophistication and the disposition effect. Management Science, 52, 726–740. Economics, 80, 563–602. 18. Fama, E. (1991). Efficient capital markets II. Journal of Finance, 46. 19. Fama, E. (1995). Random Walks in Stock Market Prices. Financial Analysts Journal, Jan/Feb. 20. Fama, E., French, K. (1988). Permanent and temporary component of stock prices. The Journal of Political Economy, 96. 21. Fama, E., French, K., Jansen, M., Roll, R. (1960). The adjustments of stock prices to new information. International Economic Review, 1 (19). 22. Feng, L., Seasholes, M. (2005). Do investor sophistication and trading experience eliminate behavioral biases in financial markets? Review of Finance, 9, 305–351. 23. Festinger, L. (1957). A theory of cognitive dissonance. Stanford: Stanford University Press. 24. Forbes, W., Hudson, R., Skerratt, L., Soufian, M. (2015). Which heuristic can aid financial-decision-making?, International Review of Financial Analysis, June. 25. Frazzini, A. (2006). The disposition effect and underreaction to news. Journal of Finance, 61, 2017–2046. 26. Gervais, S., Odean, T. (2001). Learning to be overconfident. Review of Financial Studies, 14, 1–27. 27. Gigerenzer and Gaissmaier, Heuristic decision-making. Annual Review of Psychology, 62, 451–482. 28. Grinblatt, M., Keloharju, M. (2001a). What makes investors trade? Journal of Finance, 56, 589–616. 29. Heath, C., Huddart, S., Lang, M. (1999). Psychological factors and stock option exercise. Quarterly Journal of Economics, 114, 601–627. 30. Grossman, J.S., Stiglitz, J.E. (1980). On the impossibility of information ally efficient markets. The American Economic Review, 3 (70). 31. Hong, H., Scheinkman, J., Xiong, W. (2006). Asset float and speculative bubbles. Journal of Finance, 61, 1073–1117. 32. Kahneman, D., Tversky, A. (1982). Availability: A heuristic for judging frequency and probability. In: D. Kahneman, P. Slovic, A. Tversky (ed. ), Judgment under uncertainty: heuristics and biases. Cambridge: Cambridge University Press. 33. Kahneman, D., Tversky, A. (1984). Choices, values, and frames. American Psychologist, 4 (39). 34. Kyle, A.S., Wang, F.A. (1997). Speculation duopoly with agreement to disagree: Can overconfidence survive the market test? Journal of Finance, 52, 2073–2090. 35. Lee, C.M.C., Shleifer, A., Thaler, R.H. (1998). Investor sentiment and the closed-end fund puzzle. Journal of Finance, 46. 36. Malkiel, B. (1992). Efficient market hypothesis. In: New palgrave dictionary of money and finance. London: Newman, MacMillan. 37. Neal, R., Wheatley, S.M. (1998). Do measures of investor sentiment predict returns? Journal of Finance and Quantitative Analysis, 4 (33). 39. Peng, L., Xiong, W. (2006). Investor attention, overreaction, and category learning. Journal of Finacial. 40. Presson P, Benazzi V (1996) Illusion of control: a meta-analytic review. Journal of Social Behavior and Personality, 11. 41. Radcliffe, R.C. (1982). Investments, concept analysis and strategy. Glen View. 42. Randuman, R., Jones, C., Latané, H. (1982). Empirical risk adjustments. Journal of Financial Economics, 3 (10). 43. Rendleman, R., Jones, C., Latane, H. (1982). Empirical anomalies based on unexpected earnings and the importance of risk adjustments. Journal of Financial Economics. 44. Rosses, J.B. Jr (2003). A Nobel Prize for asymmetric information: the economic contribution of George Akerlof, Michael Spence and Joseph Stiglitz. Review of Political Economy, 1 (15). 45. Samuelson, W., Zeckhauser, R. (1988). Status-quo bias in decision making. Journal of Risk and Uncertainty, 1. 46. Scheinkman, J., Xiong, W. (2003). Overconfidence and speculative bubbles. Journal of Political Economy, 111, 1183–1219. 47. Shapira, Z., Venezia, I. (2001). Patterns of behavior of professionally managed and independent investors. Journal of Banking and Finance, 25, 1573–1587. 48. Sharpe, W.F. (1995). Investments. London: Prentice Hall International. 49. Shefrin, H. (2007). Risk and return in behavioral SDF-based asset pricing models. Working paper. 50. Skinner, D. (1994). Why firms voluntary disclose bad news. Journal of Accounting Research, 32. 51. Ślepaczuk, R. (n.d.). Anomalie rynku kapitałowego w świetle hipotezy efektywności rynku. Retrieved from: http://www.efinanse.com. 52. Solt, M.E., Statman, M. (1989). Good Companies, Bad Stocks. Journal of Portfolio Management, 5. 53. Spence, A.M. (1973). Job market signaling. Quarterly Journal o Economics 78(3). 54. Szyszka, A. (2003). Efektywność Giełdy Papierów Wartościowych w Warszawie na tle rynków dojrzałych. Poznań: AE. 55. Thaler, R.H. (2000). Ludzki wymiar rynku. In: Tajniki finansów. 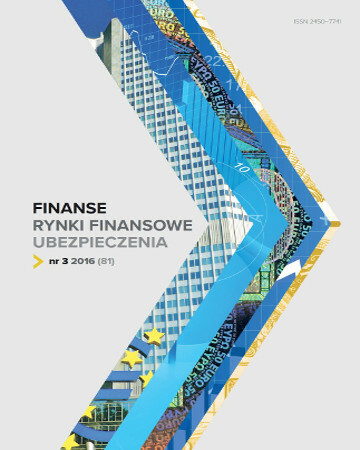 Praktyczny przewodnik po fundamentach i arkanach finansów. Warszawa: LIBER. 56. Tobin, J. (1967). Risk aversion and portfolio choice. New Haven: John Wiley & Sons. 57. Traversky, A., Kahneman, D. (1979). Prospect theory: analysis of decisions making under risk. Econometrica, 2 (47). 58. Tversky, A., Kahneman, D. (1974). Judgment under Uncertainty: Heuristics and Biases. American Association for the Advancement of Science, 185 (4157), 1124–1131. 59. Wang, F.A. (2001). Overconfidence, investor sentiment, and evolution. Journal of Financial Intermediation, 10, 138–170. 60. Watts, R.L. (1978). Systematic abnormal returns after quarterly earnings announcement. Journal of Finance, 2–3 (6). 61. Weber, M., Camerer, C.F. (1998). The disposition effect in securities trading: An experimental analysis. Journal of Economic Behavior and Organization, 33, 167–184. 62. Welch, I., Qiu, I. (2004). Investor sentiment measures. NBER working paper. 64. Zaleśkiewicz, T. (2011). Psychologia ekonomiczna. Warszawa: Wydawnictwo Naukowe PWN. 65. Zaleśkiewicz, T., Radomski, J. (2001). Investors’ risk attitudes and their behaviour on the stock market. In: A.J. Scott (ed. ), Environment and wellbeing. Proceedings of the IAREP 2001 Conference. University of Bath. 66. Zielonka, P. (2003). Czym są finanse behawioralne, czyli krótkie wprowadzenie do psychologii rynków finansowych. Materiały i Studia, 158. Warszawa: NBP. 67. Zielonka, P. (2011). Giełda i psychologia. Behawioralne aspekty inwestowania narybku papierów wartościowych. Expanded 3rd edition. Warszawa: CeDeWu. 68. Zouaoui, M., Nouyrigat, G.J.M., Beer, F. (2010). How does investor sentiment affect stock market crises? Evidence from panel data. Recherche, 46.